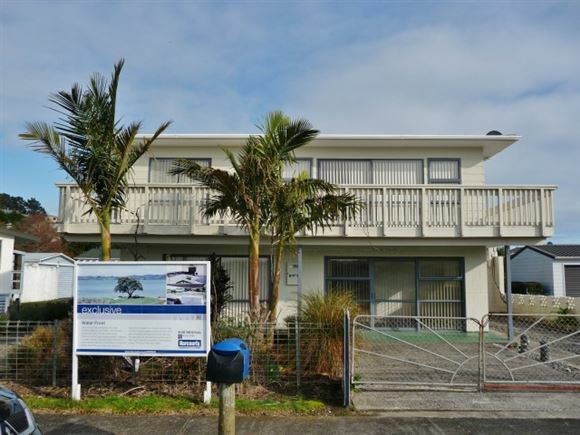 Negotiation over $299,000 Fronting Mangonui Harbour. The home has 3 very large bedrooms and a huge entertaining deck suited for those Summer evenings and BBQ's which is accessed from the modern renovated kitchen or a staircase from the backyard. The living area (reverse cycle air conditioner) has a relaxing vista out to the harbour and access to the front balcony Part of the wraparound balcony) as does the Master Suite which has a Walk-in-Robe and a modern ensuite. The downstairs are contains 2 large bedrooms, 2nd bathroom, laundry and 3rd toilet (with hand basin). Fshing and waters sports available just across the road. The current owners have experienced the joy of living and holidaying here with many photos and stories of walking over and catching breakfast ( Flounder, Kahawai, Mullet for the smoker, or live bait for Kingies and more) , just enjoying the tranquil bay and having a swim. Vehicle access is available on both sides of the home and you can access to the double garage workshop from either side with ample parking plus room for the boat. The backyard has the fisherman's corner (bench, basin and of course the smoker) 2 small garden sheds and "THE PLUM TREE" locally renowned for producing copious amounts of juicy red plums at Xmas, 6 grape vines (2 black,4 white) and a beaut vege garden. This would have to be one of the best opportunities to secure a property in this location whether it be for as a family home or a holiday home. Other special features include, Bore (has been used to top up the rain water tank) an automatic water filtration system, Launching the boat is off the beach into the harbour or a couple of minutes drive and you can launch into Doubtless Bay, an abundance of birdlife (many Tuis have been seen in the large bottlebrush at one time).Hihi also boasts excellent cell phone coverage. The Mangonui Harbour is a mecca for all types of fishing and water sports and it also offers the opportunity for the boating enthusiast (fishing, cruising or yachting) to have access to Doubtless Bay renowned throughout New Zealand for its wonderful snapper fishing and gateway to the Marlin grounds of the Far North.